A 40 y/o man presents with significant agitation and severe respiratory distress from a COPD exacerbation. His oxygen saturation is 75% on room air, and he has diffuse, tight wheezes on exam. You prepare to intubate the patient using a rapid sequence induction protocol: etomidate, succinylcholine, 8-0 endotracheal tube. This Paucis Verbis card discusses the delayed sequence intubation (DSI) protocol made famous by Dr. Scott Weingart and Dr. Rich Levitan.1 Thanks to Dr. Michelle Reina (EM resident at Univ of Utah) and Dr. Rob Bryant (Intermountain Medical Center in Utah) for designing this helpful card. Rob has even implemented a DSI protocol in his ED. The card breaks down the reasoning and steps behind DSI. 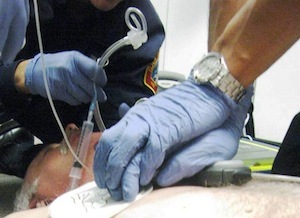 Anecdotally, ketamine has often calmed patients down enough during the preoxygenation phase to enhance oxygenation/ventilation so much so that intubation is not required.